1. Please send us your arrival details by e-mail once you made the online confirmed booking. 2. Your booking will be held 2 hours after the planned check in time unless there is notification in advance. 3. Any late notificatino for cancel or modify your booking will not take any effect. 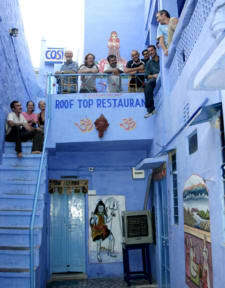 Come stay with a local Brahmin family in their historical, 500-year old blue home, in the heart of Jodhpur and at the foot of the fort, far from the noise, pollution and touts that plague most of the town's other popular guesthouses. Joshi and his family have been welcoming traveler for more than 15 years with cosy rooms, hot showers, home-cooked meals, WIFI internet and friendly help for all your travel needs. Prices range from 150 rupees for a roof top tent with a fort view to 850 rupees for our deluxe rooms that come with cable television, shower/bathtub, air conditioner and a private balcony looking out on the fort. Our rooftop restaurant has a killer view of the fort and serves delicious, home-cooked vegetarian dishes, deserts and ice cold drinks. We offer laundry services, free left-luggage facilities, internet access, bus and train booking assistance, travel advice and are located just 1.5 kms from the local bus and train stations. We arrived very late after a train from jaisalmer and the man at the front desk checked us in perfectly and even asked if we wanted something to eat when the kitchen was closed. The food was great, the rooms were clean, very blue, and the showers were the best we have had in all of India. The staff ran down to the market to get me and my partner ice cream for my birthday which was incredibly nice of them. They organised us a taxi to udaipur very early in the morning. Would stay again. Thank you! I enjoyed my stay here. The rooftop restaurant was nice and very convenient. The staff were friendly. The rooms were simple but very nice, and considering the price, I was quite happy with it. And of course, the view of the fort is amazing. A great budget hotel, the location is right in the old town and is a beautiful shade of blue. The rooms are basic but great value, it's clearly a very old building. The view from the roof of the fort and the city was beautiful at sunrise and sunset. The food was great and we loved the friendly tortoises Gita and Sita who live on the terrace. Good value for the money you pay! The place is in a narrow street so you need to walk around 5 min after the tuk-tuk drop off. Not recommended if you are traveling with annoying luggage to carry. Other things are great! Roof top with really nice views and big space. We checked out a little bit later and didn't have any problem. The view from the top of the building is incredible and the location is really good. Unfortunately the staff aren’t approachable. We arrived late at around 8pm. We received no official check in and we were given a room that we didn’t book. We had booked a double bed shared bathroom but they gave us a twin bed room. The manager resolved this temporarily by giving us a double room but we had to be out of it by 10am the next day and move to another room. But the rooms were clean and basic. The location of this hotel is at Old City. Which caused problem for vehicle and transport. Narrow lanes and much too much up ride by walk to reach here. If u r staying for some hour or just need to stay, u don't have luggage then u can go for it. The rooftop view is nice and the hotel staffs are well mannered. As this place says air conditioning I assumed all the rooms would have it as well as it was not stated otherwise. I was very wrong I had a fan but the room was so high up in a little box of a room that I honestly couldn't stay there the whole night I had to go and lay in the common area until it cooled only slightly at about 4am. Staff offered another room at a higher price but I honestly was so tired and worn out All I wanted was to get out so I went to another hostel. This is not a place I’d ever recommend to a friend because the owners are unhygienic, rude, try to scam guests by shuffling rooms to get people to stay in a more expansive room, AC is extra, some rooms are too small for one person and open to the outside. Stay somewhere else. Please.